Split Logs jointed together create the half log look, and create the solid table top. Solidly hand crafted from hand picked and hand peeled Northern White Cedar Logs. The hand peeling process leaves some inner bark/cambium on the logs accentuating the logs natural character and beauty. The logs are tenon-ed to enforce rigid construction. 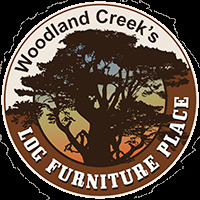 Every piece of our Cedar Lake collection of log furniture is handcrafted to be unique. This piece will match perfectly with other pieces in our Cedar Lake collection.